Review: My personal experience of a breast augmentation with a lift. 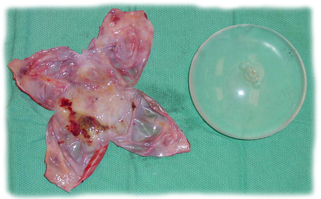 I had a breast augmentation with mastopexy, subpectoral silicone implant and bilateral capsulectomy. Simply put, I had my old saline implants that were placed over the muscle removed and replaced with the Natrelle® Silicone Gel implants, under the muscle with a breast lift and removed the scar tissue that developed around my old implants. My procedure was performed by Dr. Daniel Shapiro, at the Paradise Valley Cosmetic Surgery Center. Why I am sharing my personal story. I struggled with the decision to share my experience of having a breast augmentation. This is kind of a private issue, but I decided that I have no reason to be ashamed or embarrassed that I had a breast augmentation. I know that there are plenty of people that are opposed to cosmetic procedures, and they are quick to pass judgment on those that choose to have surgery. I think some people have created a stereo type in their mind of what type of person would have cosmetic surgery. I have read some comments on other blogs sites, that are insulting, ignorant, cruel and even hateful toward people that have cosmetic procedure. Obviously, I work for a plastic surgeon so I have some insight to the type of person that has cosmetic surgery. First of all, most of the people that have surgery do not fit the high maintenance stereo type some people might imagine and they are certainly not all rich. The truth is, there is no one “type” that has cosmetic surgery, however mom’s often desire to regain their pre-pregnancy body. That’s why the “mommy makeover” has become so popular. Society does not seem to have any problems excepting the changes that pregnancy can do to a woman’s body, so why should we feel guilty for wanting fix what we can. Maybe you were genetically blessed with naturally great breasts, that have not been affected by age, gravity or pregnancy, and you can be grateful for your assets. If pregnancy has caused your breast to droop, sag, or deflate and you have learned to love and embrace your body as it is, then that is simply what works for you. What ever the case is, it is not fair to pass judgement on those that choose to have a cosmetic procedure. If you are thinking of having cosmetic surgery, you should not feel embarrassed, it is natural to want to look good. Yes, I said my first breast augmentation. I had my first breast augmentation about 12 years ago. I was young when I had my first child and when you are in your 20’s your supposed to have perky, cute breasts, but pregnancy left me “deflated”. I knew that I might have more children in the future, but not for a long time, so I decided to go ahead and have a breast augmentation without a lift. I had a Transumbilical Breast Augmentation also known as (TUBA), because it didn’t leave any scars. This procedure seemed “trendy” at the time and I even paid about $1000. extra to have my implants put in this way. During a Transumbilical Breast Augmentation, the surgeon makes an incision in the belly button and the breast implants are put in empty with an endoscope and then filled with saline when they are in place. The endoscopic equipment creates two tunnels underneath your skin and the implants are placed, and then filled, through these tunnels. The advantage is you don’t get scars, but unfortunately you can only do this procedure with saline implants. The tissue along the tunnels rarely do, but can leave visible tracks and because the incision is far from where the implants are placed, there is a greater chance for error, especially in the placement of the implant. My recovery wasn’t that bad except my entire abdomen was black and blue, swollen and very sore. It felt like I had done a million sit-ups. They also fill your abdomen up with a gas, so your abdomen is distended for a while. I had little to no pain in the chest area, probably because my implants were placed over the muscle and I didn’t have any incisions in that area. For the most part I was happy with the results of my first surgery, except they were placed lower than my natural breasts were, so although I didn’t have saggy or deflated breasts, I did have large breasts that made my torso look shorter. I was willing to except this because I was going to have more children and I knew I would need another procedure in the future when I was done having children. I think a lot of women need a breast lift, but choose to have large implants put in instead, because it is less expensive and they don’t want the scars of a lift. Some women can get away with simply putting in implants without having a lift and still look good. I know that I am done having children, so I feel like I can finally make an investment in my body. Working for a plastic surgeon gives me a unique advantage, I get to see the results of different surgery’s. A lot of my client’s have had breast augmentations with Dr. Shapiro and they are happy to show me the results and I am always impressed. (I also get to see the work of other surgeons too.) One client was on her third surgery, (the first two were with another surgeon) she had her first surgery before children. Her second surgery was after children, but that surgeon put in huge implants instead of a lift and she wasn’t happy with that look. Her final surgery was with Dr Shapiro and he put in smaller implants and did a lift. She showed me her results and they looked great and the scars had already started to fade. I can’t tell you how many people I have met that got large implants instead of a lift and then wish they had done a lift. So my advice is, if you need a lift, get one. I know it is more money for a lift, but the cheapest procedure is the one done right the first time. I also know that people hate scars, but the truth is they do fade with time. It takes about a year for scars to fade and there are also products and procedures you can do to improve scar reduction. Dr. Shapiro has a full staff of highly experienced medical estheticians and nurses that can work with you, to reduce your scars. During my consultation with Dr. Shapiro, I explained that this time I wanted to have a lift, have my implants placed under the muscle and switch to the Natrelle® Silicone Gel implants. I had saline implants, and honestly they were fine, but I wanted to switch to the new silicone gel implants because they feel more natural and they are less likely to cause capsular contractor and rippling. I also told Dr Shapiro that I have a short torso and that my original implants were placed so low that it made my torso shorter, he agreed and said we could place them higher. We also discussed size, I was okay with my current size, but thought I would actually like to be a smaller. He assessed the size of my frame, and said we could go a little smaller, but suggested that I probably would look better if I didn’t go too small. He also explained that when you place implants under the muscle they look smaller anyway. I had one other concern, like many other women, pregnancy caused the areola to spread and I wanted to make them a little smaller. We discussed all my concerns and I felt confidant that Dr. Shapiro could create the look I wanted. I must add that a good plastic surgeon is like an artist, and I think Shapiro has a good eye for aesthetics and knows what looks good for each person. I don’t know if this comes from experience or is just a natural talent, I suspect it’s both. So, although I had an idea of what I wanted, I also wanted his opinion of what would look best for my body type. I’m kind of a control freak, but I respect and trust his opinion. I arrived at the Paradise Valley Cosmetic Surgery Center an hour early, so that I could be prepped for surgery. When we got to the surgery center I was impressed with how nice it was. The waiting room was warm and inviting, however my husband and I were quickly escorted to a private room, that was also very comfortable. A nurse came in to prep me and start my IV, then Dr Shapiro came in to go over any last minute questions and mark me for surgery. The entire ambiance made me feel relaxed, like I was at a nice hotel or spa. It is always cold in a surgery room but I was put on to this warm cushioned surgery table and covered with warm blankets. I remember thinking “wow, this is so nice” before slipping off to dream land. During surgery Dr Shapiro discovered I had developed bilateral capsular contractor, which is scar tissue that can form around breast implants and may even cause the breasts to harden. This wasn’t visibly obvious, my breasts didn’t feel hard, and nothing showed up in my mammogram. I’m guessing it’s because I had a lot of dense natural breast tissue, but I am only guessing. Dr. Shapiro had to spend an extra hour to do a corrective bilateral capsulectomy. A Capsulectomy is the surgical removal of a Capsular contracture or the formation of tight scar tissue that can develop around the implants. I would like to apologize to whom ever was scheduled for surgery after me, but I am so grateful that Dr Shapiro took the time to do the job right. He obviously cares about his patients and takes pride in his work. After surgery you are moved back into a private recovery room. I appreciate the special attention to privacy. I have had outpatient surgeries before in a hospital, and they only have little cloth curtains between patients and when you wake up and you can see and hear the nurses, other patients and their family’s in the recovery area, which means they can hear your conversations too. I remember having to go in to a hospital surgery center and I hated thinking that other patients could hear my conversation with the nurse about my post-op care. It was already a very difficult time and I had hoped that they would be more discrete. I only took a week off work to recover. I am only two weeks post-op and am starting to feel much better, however having implants under the muscle is much more uncomfortable than over the muscle. The muscle feels tight and sore, like you did a strenuous work out, but worse. I seem to feel fine during the day, but first thing in the morning, when I am getting out of bed, my breast feel heavy, they are probably swollen. If I have pushed myself, trying to do to much, I find I am more uncomfortable at the end of the night. I have had all my stitches removed, and have to wear a sports bra for 6 weeks. Dr Shapiro’s nurse Pat has instructed me on how to massage my breasts to keep them soft. I must warn you there are instructional video’s online, for breast massage, however some techniques may not be appropriate for you. Always, follow your surgeons instructions. I know you shouldn’t judge results until about 6-8 weeks post opp, because the breasts are healing and swollen. When the implants are placed under the muscle, the muscle pushes on the implant and the muscle will relax with time and the breast will look and feel softer. However, even at this point I can tell they look great. Dr Shapiro and I were joking that I owe him big, because they look so good. (Plus he had to work so hard to reconstruct and correct the damage I had) It is a little strange that they are smaller, I even felt a little sad for a moment, because I was use to very large breasts. I had mixed feelings because my larger breast made me feel a little National Geographic, and matronly. I tried on one of my old bra’s and I am actually not much smaller, it just looks that way because they are firmer and lifted. I have noticed a lot more women coming in and switching out their large implants, and now I know why. It really looks better and believe it or not younger. This entry was posted on Monday, March 7th, 2011 at 9:47 pm	and is filed under Plastic Surgery. You can follow any responses to this entry through the RSS 2.0 feed. You can leave a response, or trackback from your own site. I’m proud of you for being brave enough to share such a personal thing. I don’t think I could do it, but I’m sure that anyone considering this procedure will feel better and more confident about their own descision after reading your post. I intended to compose you the little note in order to thank you very much the moment again with the breathtaking things you have shown at this time. This has been tremendously open-handed with you to present openly all that many individuals could possibly have offered for an electronic book to help make some bucks on their own, principally considering that you might have tried it if you wanted. Those tricks also served to become a fantastic way to be certain that many people have similar dream like mine to see a little more around this matter. I am certain there are a lot more enjoyable sessions up front for individuals that take a look at your website. Wow this is something i have not seen before, i mean the implants. I underwent breast augmentation myself about 6 months ago. Honestly i was searching a lot before the surgery what is waiting for me, but have not seen this. But i was still happy for the consultation at Forme clinic where i could find out the most of information. The surgeon spoke clearly and was happy to answer anything i asked. My breast healed well, i was also off the work just for one week, that was absolutely enough. Love my size, not too big just enough but what i love the most they got nice shape and younger look.